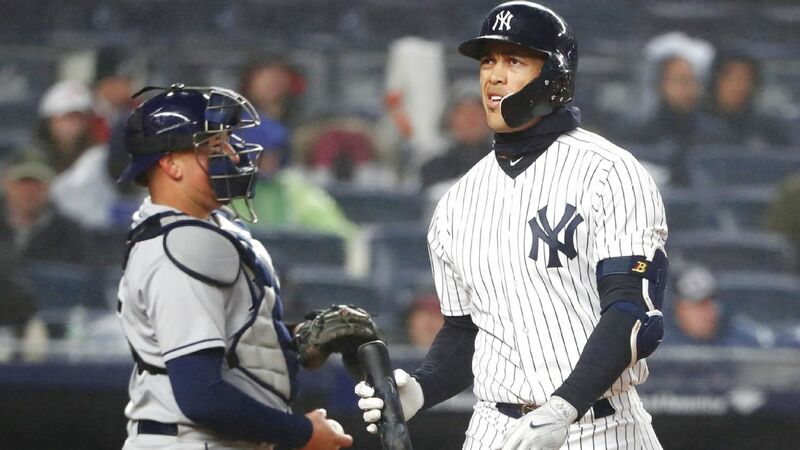 NEW YORK -- As Giancarlo Stanton's struggles at Yankee Stadium persist, New York Yankees manager Aaron Boone said Tuesday night he may entertain the possibility of moving the slugger down in the batting order in hopes of jump-starting his bat. "I might flirt with splitting different guys up and stuff, but not moving him down too far," Boone said. Stanton has batted third in each of the Yankees' 16 games this season, including in Tuesday night's 9-1 loss to Stanton's former team, the Miami Marlins. In the eight games he has appeared in at home, he has hit .086 (3-for-35) with 20 strikeouts. According to Elias, those 20 strikeouts are the most for a hitter in his first eight home games during the modern era, which began in 1900. The 17 strikeouts he had through his first eight games as a member of the Marlins in 2010 are also tied for second on that list with three other players who all happened to accomplish that feat since 2002. After striking out twice Tuesday, Stanton was booed loudly by fans who have grown frustrated with his performances in the Bronx. On the road, Stanton has been markedly better, batting .323 (10-for-31) with three doubles and seven RBIs in those eight games. Asked if he could come up with a reason for the home-road statistical disparity, Stanton simply said: "No." If a change to the Yankees' lineup comes, it likely will arrive during the team's four-game home series against the Toronto Blue Jays that begins Thursday following an off day Wednesday. Boone said any changes that come during the series would depend upon how the Blue Jays' pitching matchups line up with what the Yankees want to do offensively. Boone said he might alter the first five or six spots in the lineup, but don't expect him to move Stanton into the bottom tier of the order. "He's one at-bat away from getting it locked back in, and then the last thing you want is him down in the order getting pitched around," Boone said. "He's too premier of a player, and an at-bat away, in my eyes, from locking it in." Although Stanton struck out twice in Monday night's 12-1 win over the Marlins -- he was the only player in New York's starting lineup who didn't have a hit in the game -- he launched a long foul ball in his first at-bat of the game that would have been a massive homer had it stayed fair. The third-deck shot had Yankees fans audibly gawking. That was the last time he impressed spectators during the brief two-game series against his old teammates. Stanton understands why he's hearing boos at home, but added that it's been "very simple" to block them out. "Worry about the positive things, even if it's not very many things," he said. "If you worry about [the boos], you keep twirling down." What positives have there been so far? "It's early, so not too many," Stanton admitted. "But you've got to own up to it and understand and find a way to get better. Find a way to get out of it." Boone still believes Stanton will snap out in a matter of time. "I'm really confident the work that he's putting in," Boone said. "And I'm confident that once he gets rolling, it'll be a juggernaut. I want him just for peace of mind to get going a little bit and kind of settle in and get into the rhythm of the season, but long-term, he's too good for it not to start happening." Yankees manager Aaron Boone expresses his support for Giancarlo Stanton as his early season struggles continue against the Marlins.